It’s finally spring, and I’m eager to say so long to cold and dreary winter and hello to warmer, brighter, springier days and the colorful flowers they bring. 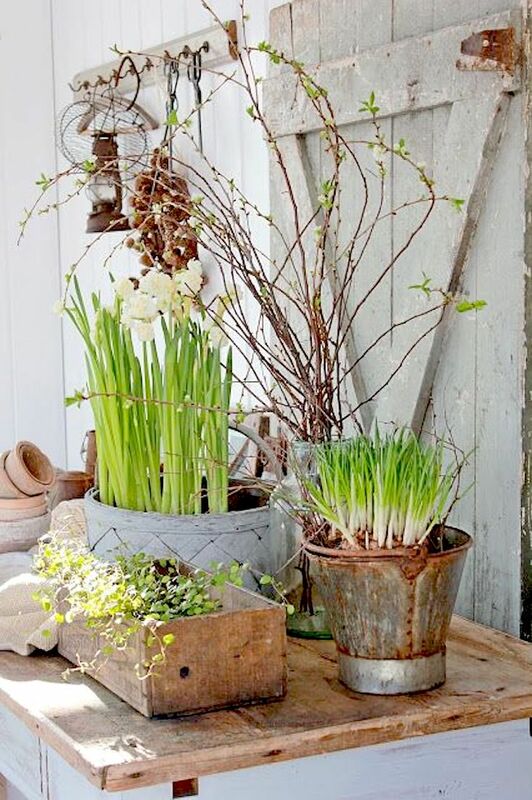 Daffodils, crocuses, hyacinths, and tulips already are out here, but if, like me, you can’t wait for your flowerbeds to break out in blooms, you can put your green thumb to work with some creative spring garden pots and planters. First we’ll look at some great containers and then share some beautiful planters, many of which you can duplicate at home. 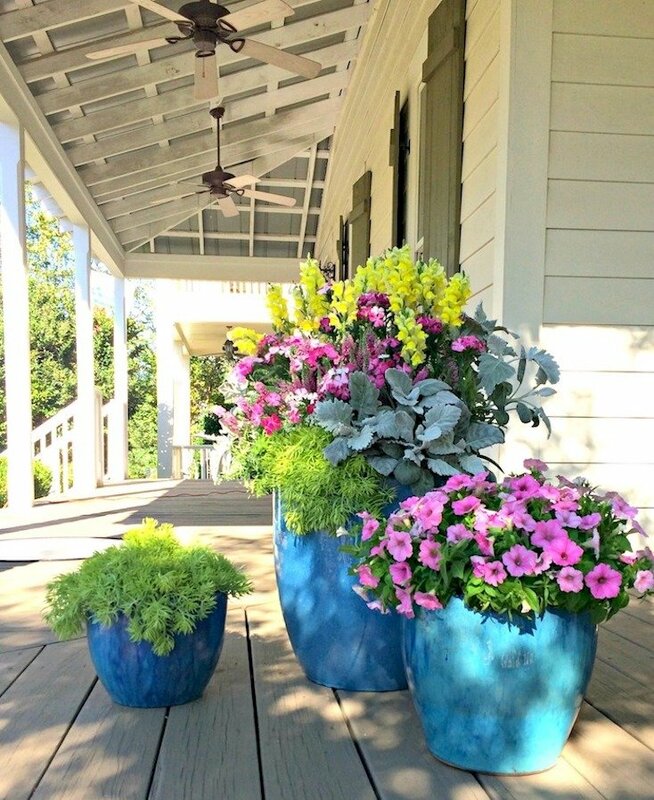 You can plant flowers and bulbs in many types of pots, from classic terra-cotta, available in most home improvement stores and easy to paint to just the right color, to more elaborate containers made of ceramic, metal, or even wood. 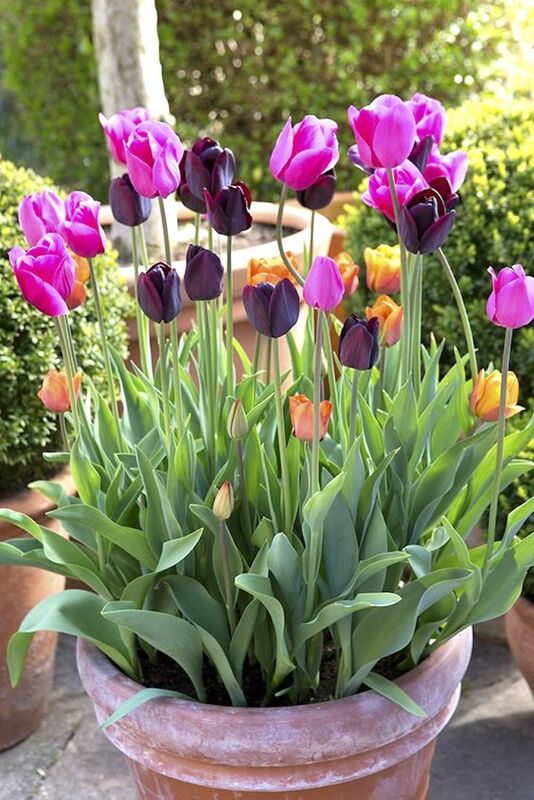 This large terra-cotta pot holds a variety of brightly colored tulips, perfect for an easy seasonal container garden. 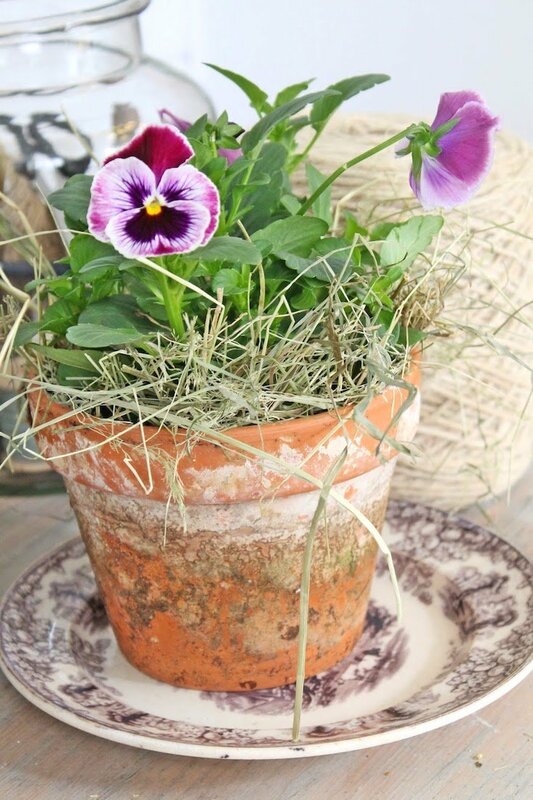 Another terra-cotta pot, this one aged a bit for some rustic charm, is a lovely pared with pansies. This terra-cotta pot has been lightly whitewashed, and a second pot has been added to hold a candle. 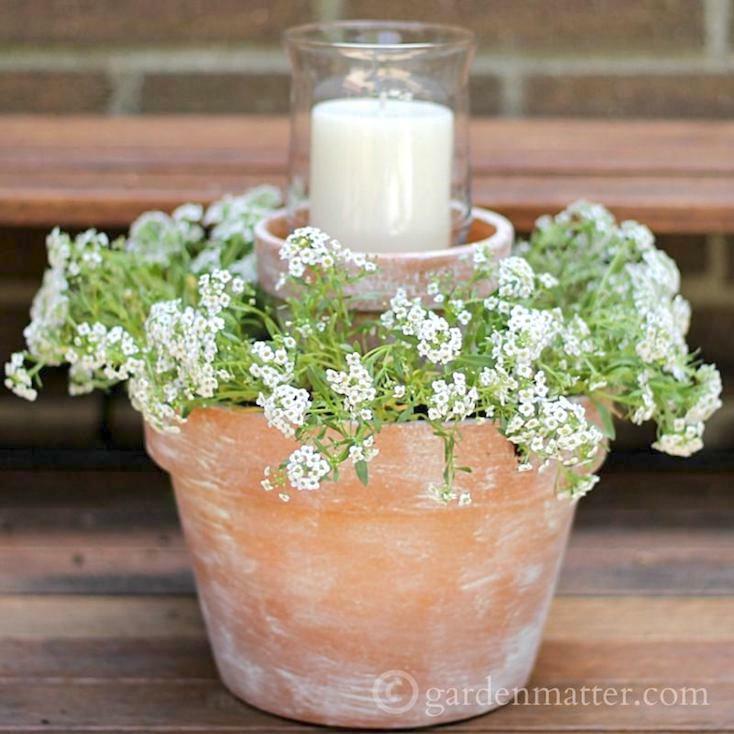 The sweet alyssum planted around the candle make it a sweet and simple centerpiece. Clay and terra-cotta pots are so easy to dress up. 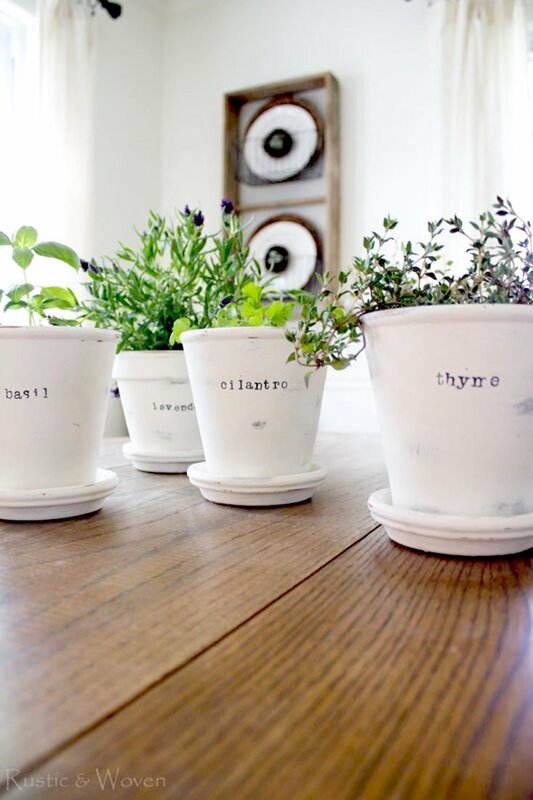 Here, chalk paint and some stamped letters transform plain pots into a farmhouse-inspired container herb garden. 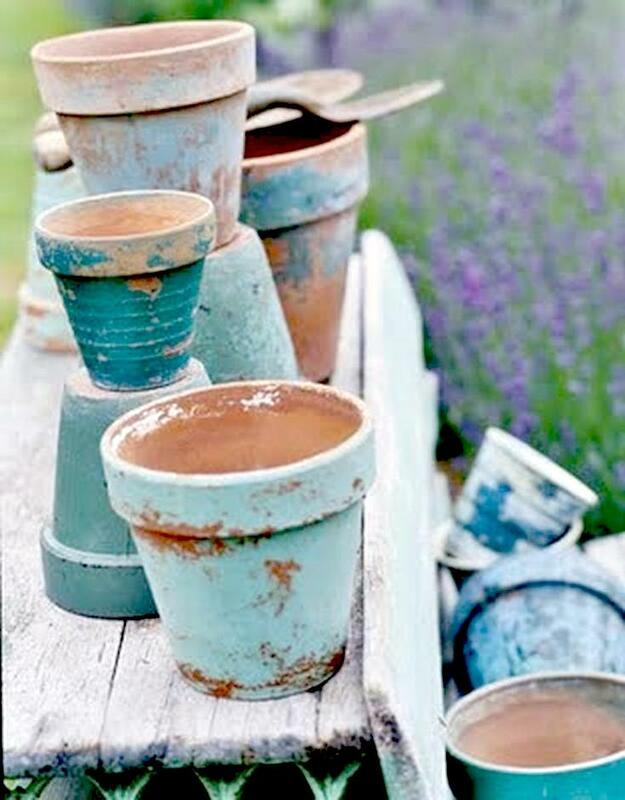 To give new terra-cotta pots an aged look, spray- or brush-paint them and when the paint is dry, sand the pots in a few spots to distress the finish. 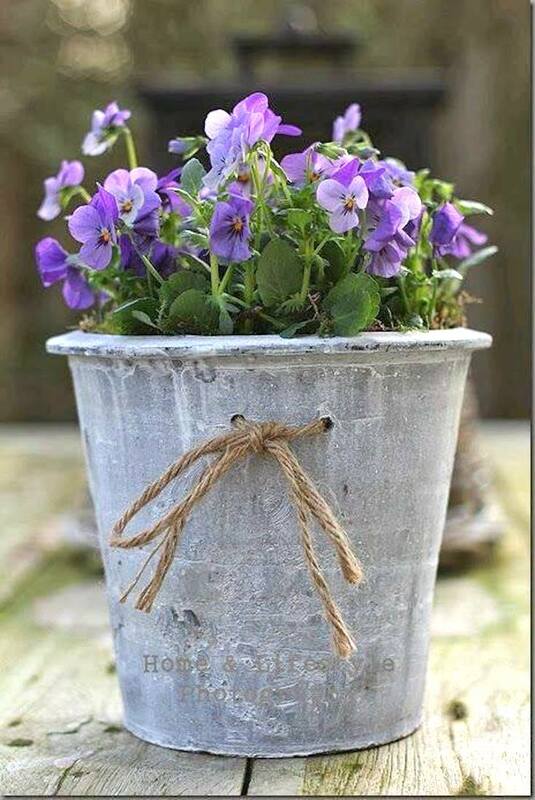 This pretty pot, which looks like slate, is a lovely match for little purple violas. The simple jute bow is a nice touch, too. Baskets, boxes, buckets, jars—you can tuck plants and bulbs into just about any container. 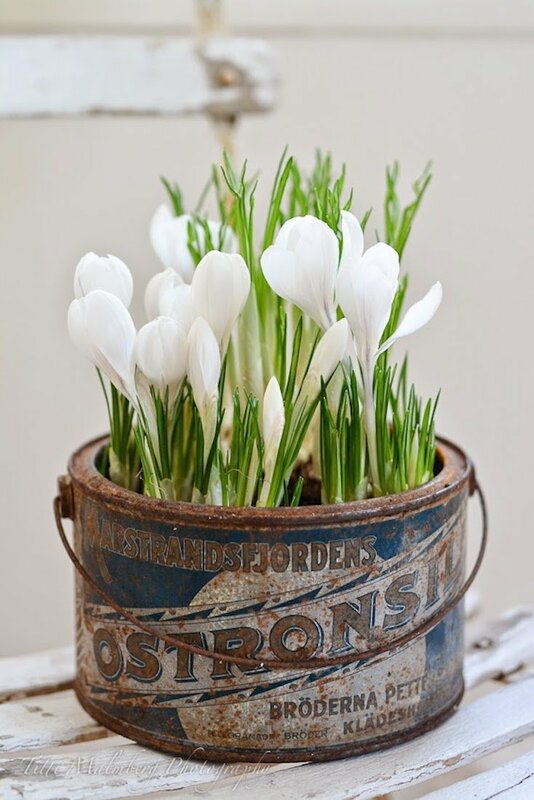 How sweet is this little old bucket full of white crocuses? 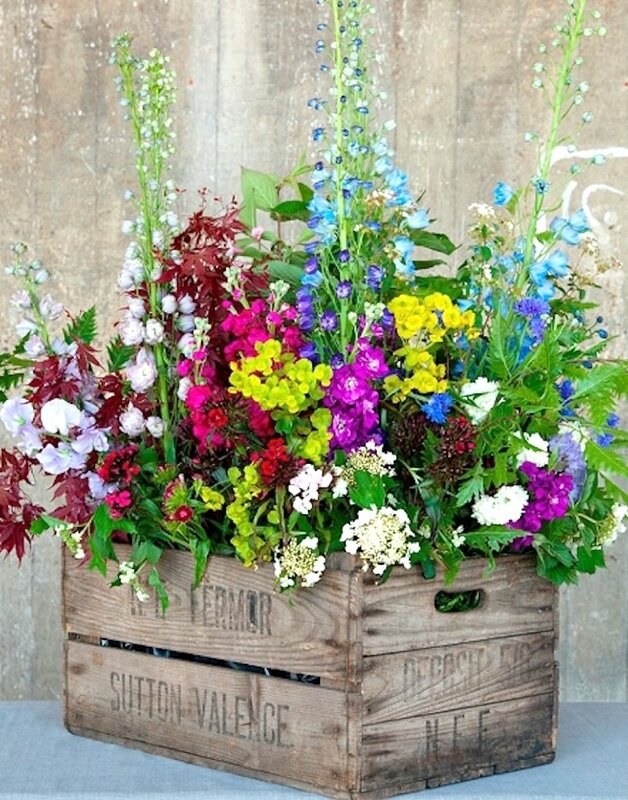 This vintage wooden crate holds a beautiful variety of colorful spring flowers. With planters, you can get really creative and play with different colors, textures, sizes, and scales of plants to create stunning combinations. It doesn’t take a lot to assemble a pretty planter. 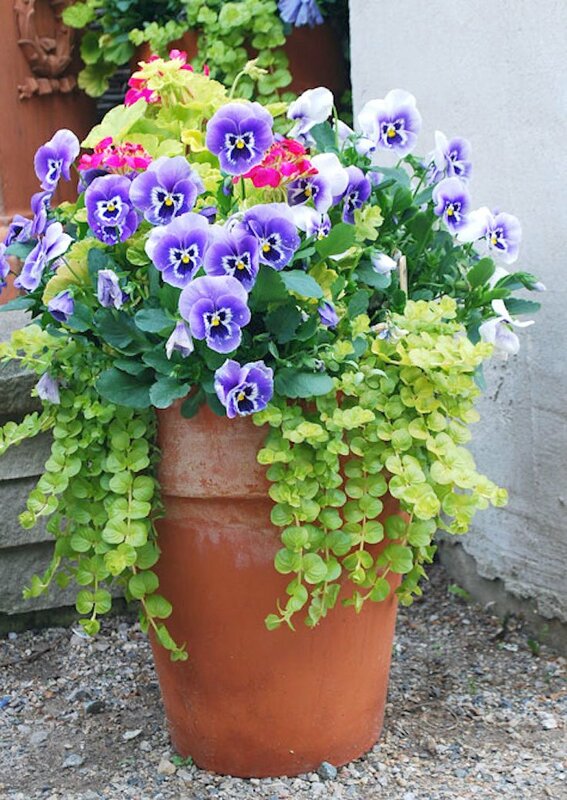 Here, pansies, creeping jenny, and maybe a geranium are nestled in a large terra-cotta pot. Or you can plant quite a mix of plants, like dusty miller, snapdragons, sedum, dianthus, petunias, and more. 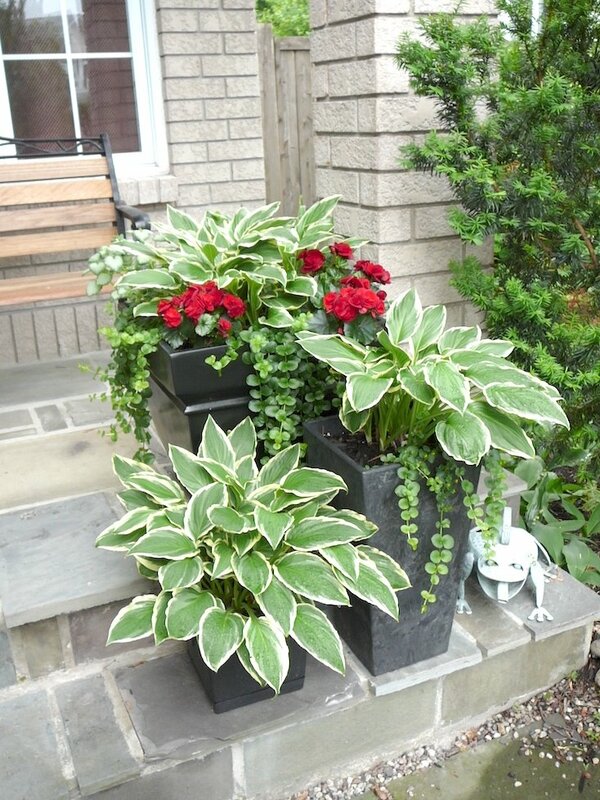 For an easy planter combination, plant hostas in your pots. If they’re protected enough during the winter, they’ll return in the spring/summer, ready for whatever else you want to tuck in with them. 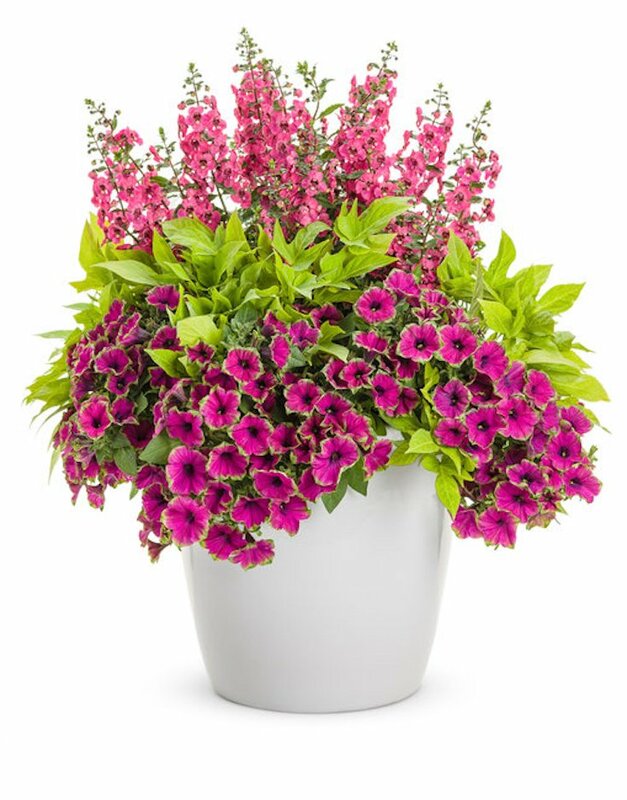 In this bright and cheery pot, snapdragons, sweet potato vine, and supertunias have been combined. 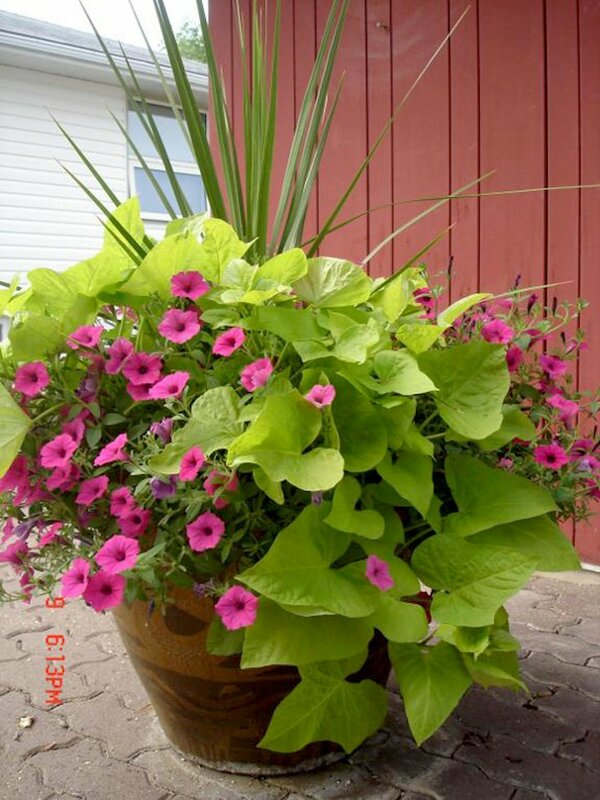 Petunias and sweet potato vine explode from this large pot. The spike plant offers height to contrast the lower-growing plants. 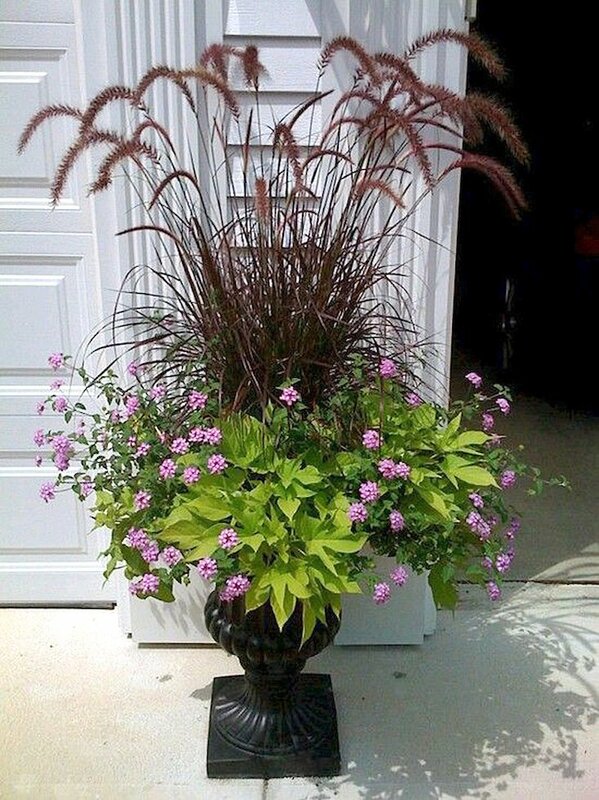 This planter features purple fountain grass, sweet potato vine, and lavender lantana. So pretty! Here’s another great grass inclusion. I love the pop of color the orange daisies bring to the otherwise-green grouping. Herbs can be included, too, as in this rosemary and verbena mix. 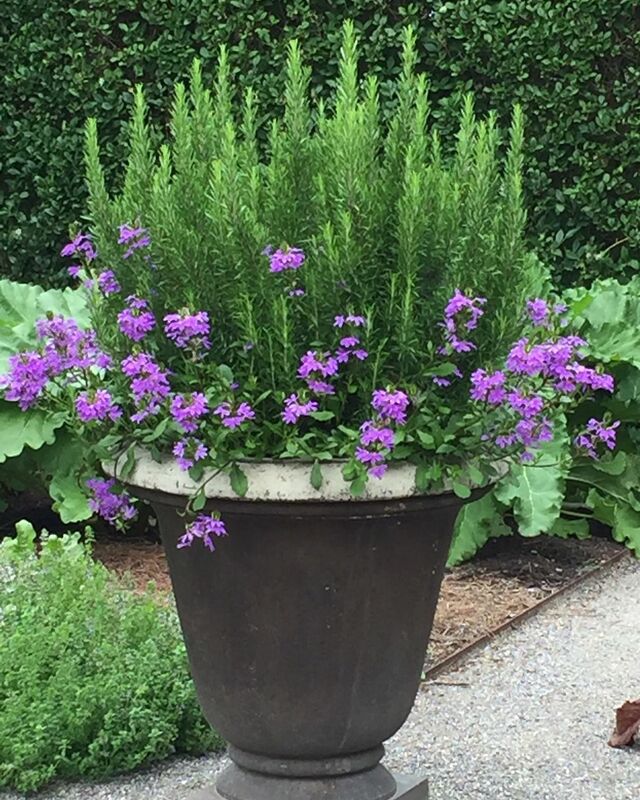 The verbena grows out and about while the rosemary grows tall—and probably smells wonderful! 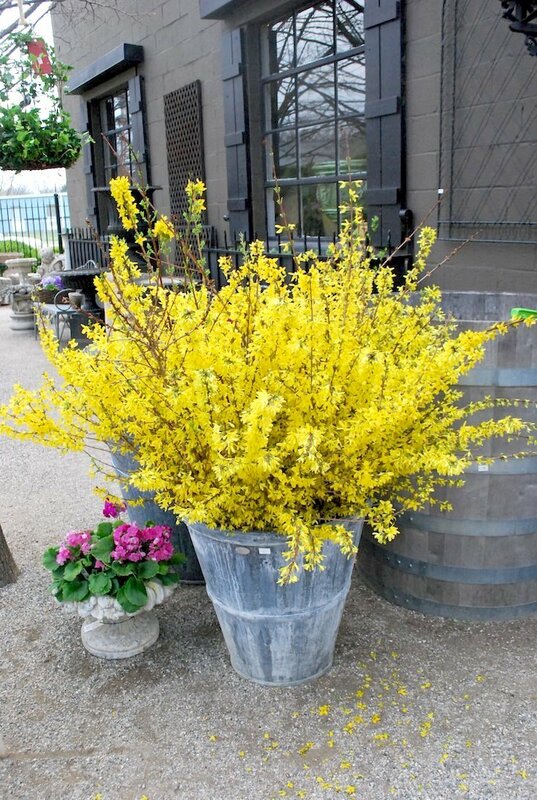 If you don’t want to have a combination of flowers, a single blooming bush can make a big statement, as this sunny forsythia bush does. This container bush isn’t a bloomer, but it’s still colorful, thanks to the blueberries growing on it. 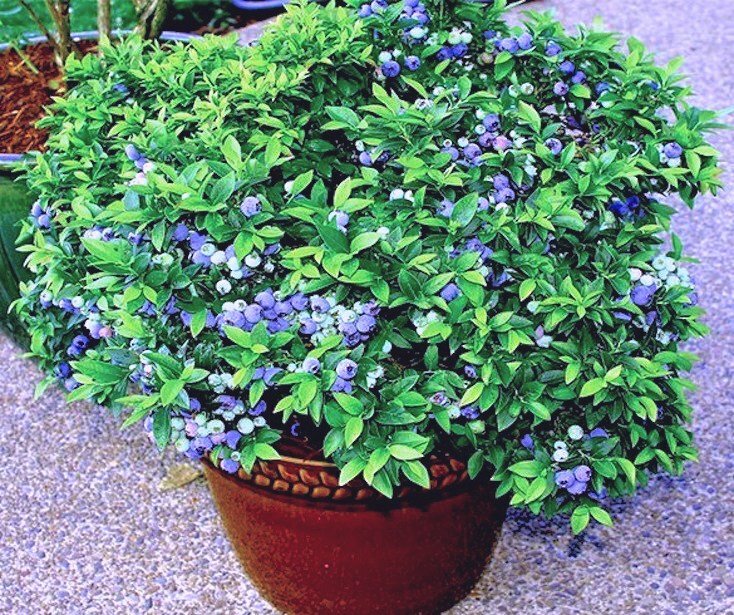 Yes, it’s a blueberry bush! 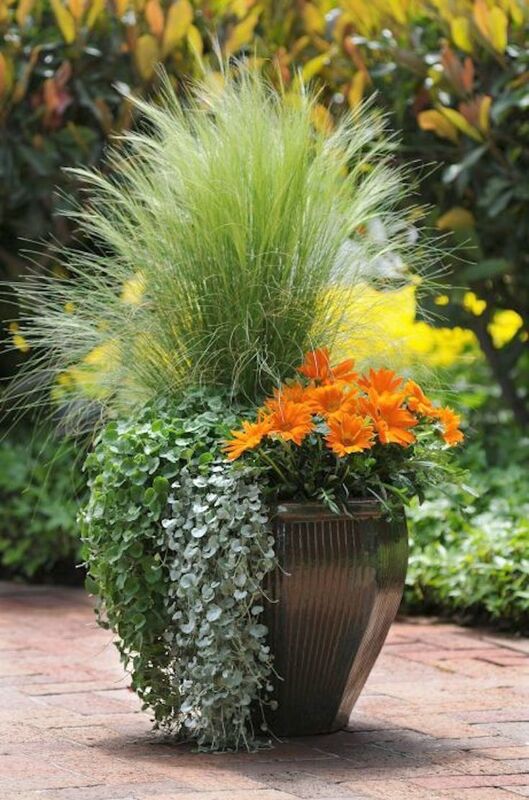 For a container planting, opt for a dwarf variety. 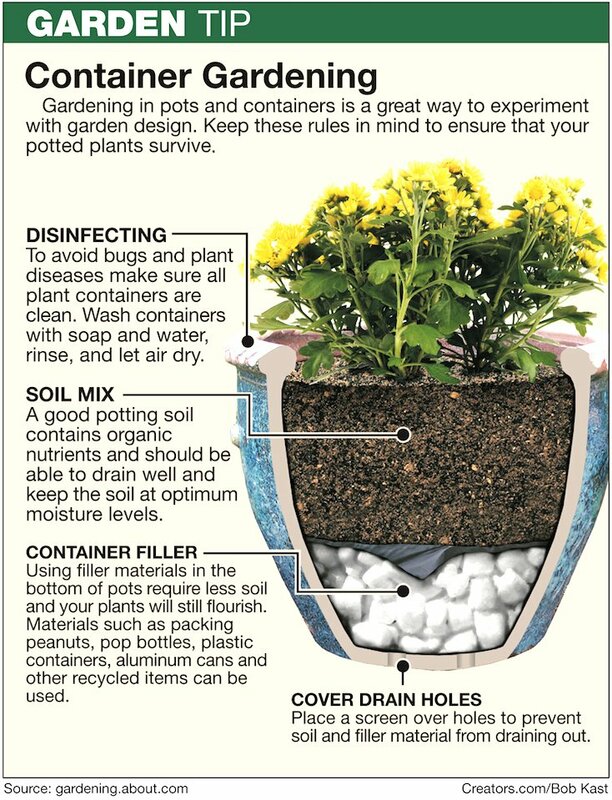 If you’re inspired to assemble some of your own planters, either with multiple kinds of plants or a single spring-blooming bush, this illustration offers pointers on preparing your container. 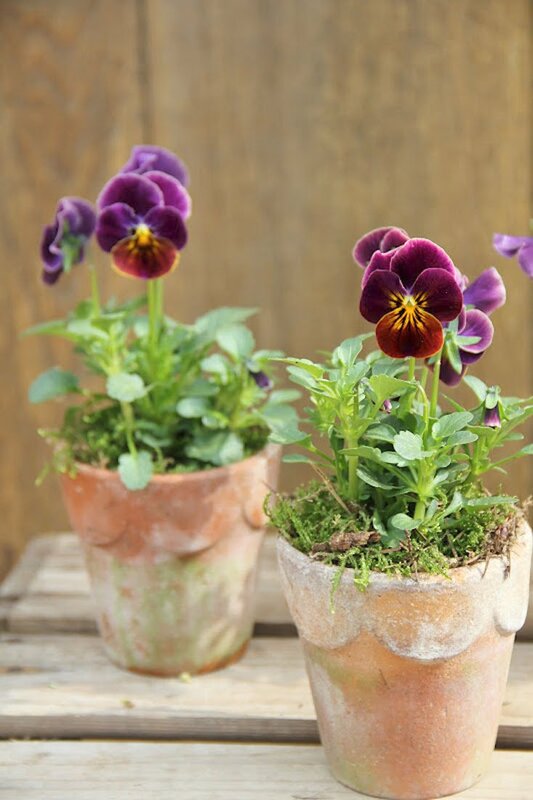 What better way to welcome spring than by planting flowers, either in smaller pots or larger planter groupings!